So last week Rick had his three-month scans which included MRI and CT scans and the usual bloodletting. Scan day is emotionally draining and exhausting. Reminders everywhere of how far we have come … and we don’t want to go backwards. Yep … and it never fails. Despite the anxiety, we chuckle every time we spend the day at MD Anderson. There are new things to learn. This time the lab where Rick has bloodwork in the Mays Building went all techie. We used to fill out a slip of paper with pertinent patient information before dropping it in a little plastic basket and wait to be called up to the desk. The paper slips have been replaced with electronics. Progress? Yesterday, when we arrived at check-in to see Dr. Campbell, all the iPads, except one, were out-of-order. Rick’s clinic went all techie a while ago. Not complaining mind you! I can relate! Heck … after replacing my sim card and getting a new iPhone, I am still dropping calls. So to put life for us in perspective … since his diagnosis of Stage IV Kidney Cancer just over two years ago … Rick and I have welcomed two grandbabies. Ben, 18-months-old now, was born down the street in the medical center on one of Rick’s long immunotherapy infusion days. And little Zelie was born two weeks ago to our son and lovely daughter-in-law, Kate. Even Jacob has been deeply involved in Rick’s journey. Now four, Jacob came to wish his Pop-Pop good luck two years ago on the day Rick’s tumor/left kidney was removed. Jacob also walked the MD Anderson’s Boot Walk with us this past November while Baby Ben slept in his stroller. You don’t have to tell me we are blessed. So just how did it go yesterday with lab results? Our visit with Dr. Campbell, our oncologist, and his lovely PA, Simi, was all we had prayed for. MRI … stable. CT … stable. Rick is just over a year from getting kicked off the clinical trial and receiving no cancer treatment. He still itches all the time, mostly from the inside, which tells us the immunotherapy is still working. I asked Dr. Campbell how patients who are on Rick’s clinical trial are doing because I want to know. My editor, the lovely Cynthia, has trained me well. I had my steno pad all ready for details and statistics. Dr. Campbell indicated 55% of those on Rick’s immunotherapy clinical trial drug ARM of Bevacizumab and Nivolumab are having positive results. In the coming months, the trial will end and it will be number crunching time. I will be there with pen in hand to probe for any updates. It is my hope these two drugs will be the answer for all Clear Cell Kidney Cancer patients … not just for the 55% with positive results. That is probably just 50 people. And now for the really great news … we don’t go back for FOUR months!!!! Can I get an amen? The following “You Gotta Laugh” column … a tribute to my sister … appeared this week in The Tribune Newspaper. I have reposted below … and provided a link to their website! Note you can sign up for free with a username and password for their site. Did I ever mention I am the oldest of five? My sister, Mary, is just 19 months younger. During our growing-up years, Mary and I had lots of adventures together and shared a room until we hit our teenage years. Today it seems a lifetime ago. My favorite photograph of my sister is one that resides on a shelf in my sewing room. In the black and white pic, Mary is sitting confidently atop a furry-maned Shetland pony. I feel certain she was about three years old. The cutie pie has short blond hair and round face with a smile that says let’s get this party started! My mom tells the story how one day a man with a pony and a camera walked around our neighborhood offering to photograph children. He even came prepared with a cowboy hat and chaps for the kids to don. The chaps had a lasso and the initials “RR” embroidered inside the lasso loop on the lower leg. I like to think the initials stood for Roy Rogers and not the dude with the camera. Actually, Mary and I both had our photos made that day. The only difference is the way we held our cowboy hat with our right hand up in the air. Today Mary and I sit side-by-side frozen in time in a double frame. Then there was the time Mary lost her two front baby teeth. Not a remarkable incident, except the permanent ones were taking forever to make their appearance. While most kids were singing “Santa Claus is coming to Town,” Mary proudly sang, “All I want for Christmas is my Two Front Teeth” with a lisp. When her front teeth finally did appear, there was a little gap. It was just enough to squirt water through. When we got a little older, Mary and I would escape the house on Saturday for the local movie theatre leaving our little brothers and sister in the dust. Back in the Stone Age, a movie ticket cost 35 cents and bought two movies, cartoons and previews. For ticket money, we scoured the neighborhood ditches for glass soda pop bottles. At two cents deposit a pop, it didn’t take long to hit our goal. A quick trip to the drug store for candy and our mom didn’t see us for hours. It didn’t matter what kid-friendly movies were playing. We watched them all. I do recall one that scared the bejeebers out of both of us. It was an Edgar Allen Poe inspired flick entitled “The Mask of the Red Death” starring Vincent Price. Imagine trying to crawl under the seats as the tension builds on the screen. We crouched on the sticky concrete floor waiting for the scary part to be over. It never happened. I think we lasted 30 minutes before running toward the exit and all the way home. Fast forward a bunch of years. Mary and I married our respective sweethearts six months apart. We even lived a short distance away from each other for a time. I remember the day Rick and I got the call in the middle of the night to drive Mary to the hospital. She was in labor with her first child, Christy. Since her husband was a fireman stationed downtown, Rick and I were the designated backup drivers. When we arrived to pick Mary up, I will never forget finding my sister calmly watering her plants, feeding the fish and straightening up the kitchen. She obviously was not in a hurry … but we were. After finally getting her loaded in the passenger seat of our little Toyota Corolla, Rick sped toward downtown where Greg would be waiting at the hospital’s front door. Each time my sister made a peep, Rick would start to sweat. We were not trained in labor and delivery. Then Mary let out a wail at a red light. “Geez, it’s three in the morning. There is absolutely no traffic. Do you think it would be OK to just go through the red lights?” Rick stuttered. Not even waiting for a response, he put the pedal to the metal and we arrived 20 minutes later at the hospital to a waiting Greg. My sister, Mary, died the day after Easter of Ovarian cancer. The disease took her just seven months after diagnosis. She was 62 years young. Yesterday, Rick did his usual early morning bloodletting in anticipation of perhaps another immunotherapy infusion of nivolumnab. It was not to be. Rick’s lipase was 3,082 (normal is between 23 and 300) and during the past two weeks he has felt it. So … Rick is officially off the clinical trial. The nivolumnab is not being kind to his pancreas and essentially the important organ has made it perfectly clear Rick’s body has had enough … for now. From a cancer perspective, the drug has done amazing things and we are over the moon about his progress. In February of 2016, thoughts were creeping into our minds a funeral was on the horizon. We were so close to the edge of the cliff. Today, Rick and I are making travel plans for adventures, grandson Baby Ben’s baptism, grandson Jacob’s third birthday, our son Ricky’s graduation with a Master’s (party time!) and so much more. Did I mention Rick and I will celebrate 45 years of marriage in May? I know … 2017 is going to be a great year. Another round of steroids was prescribed … and amazingly … today Rick is feeling better. So what happened in 2016? We did some really hard work at MD Anderson Cancer Hospital in 2016. Along with tons of prayers, love and support, some incredible healing happened. Some time this year I want to write about all the people that helped us with our special needs daughter, Mimi. An important part of the story I have left out. I calculate Rick had at least 40 tests (most of them bloodwork, scans, etc. ), 34 physician visits, one huge surgery with a 5-day stay to remove his left kidney, three initial immunotherapy drug infusions of nivolumnab and bevacizumab, 11 immunotherapy infusions of nivolumnab after surgery, and three missed infusions due to high lipase levels. What can I say … Rick is a “rock star.” Took him ten months to kick nearly all those tumors down the road and into a ditch. In mid-November, Rick had his 10th maintenance infusion of Nivolumab at MD Anderson. Of course, the day is a bit more involved than just heading up to the 8th floor. During our appointment with our awesome oncologist, Dr. Campbell, we talked about Rick’s bloodwork. All looked good … except his pancreas, or lipase, level inched just over the line to 326. Something to watch … but we got the “Mother May I” to head to infusion floor. Since we have already spent a fair amount of time over the past few months on the 8th floor, we have got to know a nurse that really knows her way around putting in an IV. She seems to be able to get that sucker placed with a minimum of “ouches” and little to no bruising. So of course, now we request the amazing Elizabeth! I think we were headed out the door for home by 2 or 2:30 p.m. A most excellent day! Then last week, on December 1st, we went to MDA for Rick’s 11th infusion. Again, bloodwork looked great … except lipase had nearly doubled to 710 … not as high as after his kidney surgery. But not good. But the dude is feeling just fine. Yep … we got sent home anyway. The old “do no harm” was invoked and we certainly gotta respect that. We don’t have to like it though. I think we sat in the waiting room for ten or so minutes digesting what just happened. I didn’t cry. But we were both quiet. Then hubby placed a call to our oldest. Katie had Baby Ben a couple of weeks before and lives not far. So instead of an infusion … we opted for holding our new second grandson tight for just a few hours before heading north! It was also a most excellent day! A cancer journey with immunotherapy – infusion #7 sweet spot and a return trip! Last week we had a major milestone with “the schedule” at MD Anderson. We discovered our sweet spot after lots of 12-hour “infusion” days. Basic schedule now is bloodletting at 6:30 in the am, meet with clinical trial nurse and oncologist at 8:30, and then a lovely infusion before and during lunch! No more grumpy bug faces on our part. I think we got this! Maintenance infusion #7 was a like a gentle fall breeze and we got home about 2 pm. The most interesting part of the day was meeting with one of Dr. Campbell’s fellows! I learned our awesome oncologist, Dr. Campbell, gets a new one each month. I wish I wrote down his name. The young man was chatty … I love that … and has a PHD in immunology. He told us Rick had kidney cancer long before the severe symptoms appeared that lead us on the quest to figure out what was wrong. He called those scary symptoms the “tipping point.” I learned once you get to that point it is imperative to quickly get a correct diagnosis and start treatment. We also learned that Rick’s clinical trial for clear cell kidney cancer now has all their sixty patients. Rick was number 36. No more slots are available. So far Rick is still the rock star performing the best in this particular immunotherapy trial. Sixteen and one-half months to go! The day after the infusion we took a trip … back to Washington, DC … to hang for a few days with our son and lovely daughter-in-law. We were there last in March to fulfill a promise and witness Kate’s confirmation into the Catholic Church. That trip was also after Rick’s very first infusion after being approved for the clinical trial. We went back and forth on the teeter totter about whether we should go. Rick was in lots of pain and nauseous most of the time. It was Rick’s decision to go for it … and we made it happen. I remember pushing him through the airports in a wheelchair. Back then he didn’t walk much in D.C. He was mostly there in spirit. What a difference seven months make. This time we stayed up late, walked our feet off, got up and personal with lots of Washington D.C.’s monuments, went on an awesome history tour (History Nerds) of the Gettysburg battlefield, played trivia with Ricky’s cadets in a bar, toured the Holocaust Memorial Museum, and so much more. I think I got my hubby and travel buddy back! My favorite day was the Gettysburg battlefield tour in Pennsylvania. Ricky and the lovely Kate had purchased the tour for hubby’s birthday present in September. I had no idea Gettysburg was only a ninety minutes drive from Washington, D.C. Al Condit was our amazing tour guide on the History Nerds tour bus which lasted just over two hours. The comfortable bus held about a dozen people. Al knows his Gettysburg history and provided non-stop fascinating commentary and occasional videos on the famous three-day battle. We got out of the bus a couple of times … once on the Confederate side and once on the Union side at Little Round Top. While there are many ways to experience Gettysburg … I totally recommend the History Nerd tour. Just saying! Our grandson, Jacob, loves to poke around my sewing room. I make it a point before he is due to arrive to lock up anything remotely interesting and dangerous to a two-year-old like pins, rotary cutters and scissors. Earlier this year he got a peek at the “I Spy” quilt I made for a charity event. Little did Jacob know I was working on one for him also! The pattern is again from Missouri Star Quilt Company and so is the novelty layer cake fabric of ten-inch squares. With Jacob’s quilt, I added a couple of his favorite Minion fabric “jars.” I also used a mottled black fabric for the background which I love over the flat-looking black fabric on the charity quilt. After finally getting the quilt top finished, I asked Jacob to pick a binding fabric. The charity quilt binding was black and totally worked but I wanted to try something different. Jacob’s choices were ladybugs or zebra print. Obviously, ladybugs won! The ladybug fabric is by Charley Harper. The awesome Kim Norton, at A Busy Bobbin, quilted with an all-over digital pantograph design called Circle Swirls using a multi-colored King Tut thread (921 Cleopatra). I absolutely love collaborating with Kim! The adorable Tracy at Personalize It embroidered the quilt label for the back. Each early morning visit to MD Anderson reminds me of setting up a bunch of dominos on their short edges in interesting configurations. The hope is after touching the first one, the dominos will all fall, one right after the other, so we can hurry and get back on the HOV toward home before the sun sets. We still haven’t gotten used to the fact … it is probably not ever going to happen. It is why we take two cars for infusion day. That way I can be sure to get home in time for Mimi’s bus. Maintenance infusion number three happened on August 11, and started with the usual bloodletting. Step two is wait to chat with clinical trial nurse to go over symptoms and blood work. We have always been told the wait is two hours to get back test results. So of course we left the 7th floor and headed down to Cool Beans for coffee and hot chocolate. We found a quiet corner table and Rick set up his phone with our favorite playlist for some chill time. We headed back to the 7th floor only to find out they were looking for us an hour before to get started chatting early with the clinical trial lady. So much for speeding things up on our part. We won’t do that again. Good news … Rick’s lipase number continues to improve. He is back at the top of the normal range. We chatted with the PA, the lovely Simi, and Dr. Campbell paid us a visit. Turns out he read my blog. It seems I remind him of his mother, who is also a quilter and, I think, teaches English Literature. Who knew? Step three … we headed to the eighth floor where the infusion would happen. We check-in and then go to lunch before heading back up to wait some more. This part of the day is always where Rick and I turn into grumpy bugs because of all the waiting … sometimes three or four hours just to get sent back into the room for the infusion. It is painful. I know lots happens behind the scene until the infusion finally goes drip, drip, drip for an hour. Then wait another hour afterward, for side effects, and finally head for home … in time for dinner. 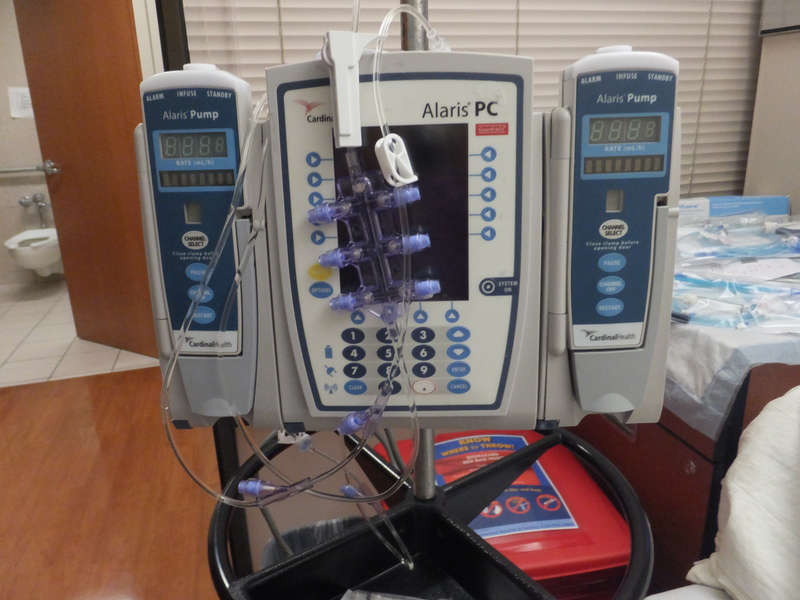 Note to self … always go to infusion therapy to get IV started. We forgot this time. Some of the ladies in charge of the actual infusions don’t do that part very well. It is painful to watch. I can imagine how Rick felt. Fast forward to yesterday and maintenance infusion number four! It was pretty much rinse, wash and a repeat of the last one. Only this time MD Anderson had installed IPads on the wall near the check-in desks. The concept sounded like it might work, but I think they need to tweak that one a little. After IPad check-in, you sit down and wait to be called on your cellphone to head toward the check-in desk to get your mandatory MDA “wristband.” The IPad also forgot to inform the MDA peeps that only do “vital signs” that Rick was in the building. Bottom line … this time we didn’t leave the 7th floor for Cool Beans. Well … actually I left and came back with coffee and hot chocolate. Rick’s lipase is still dropping. It is obvious now the high level had something to do with his kidney removal surgery. Rick had his IV put in by Infusion Therapy peeps. He didn’t get a good one. She stabbed him twice before Rick requested someone else. Then finally the infusion after a long four-hour wait. Rick made it home again in time for dinner. To mark our continued progress, we are now collecting the wrist bands we cut off at the end of infusion day to visualize how far we have come until the trial finishes in March of 2018. I wish we had started this at the beginning. We would probably have 40 wrist bands by now with all the testing and other doctor visits. In September, we have two more maintenance infusions, MRI and CT scans. It will be interesting to see if things continue to shrink. So the dominos … they continue to fall. Maybe not always in the orderly way we want them to. Lord, I think we need to add patience to our list. We continue to feel so blessed and thankful for Rick’s return to good health.